For pet owners who must leave their cat behind when they travel or go on vacation, cat boarding is worry-free at Hastings Veterinary Clinic. Personalized, focused cat care is available for your feline. We encourage everyone who is curious about our cat boarding facility to come in person and inspect the premises of where your kitty will be boarding. That way you’ll be rest assured that he or she will be happy and safe. 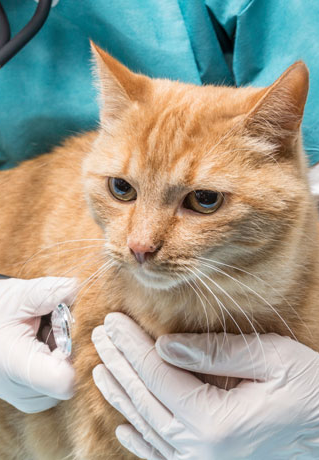 Our veterinary hospital can provide all the elements of good cat care and you can schedule any needed check-ups, vaccinations, or tests to be performed at the same time. We will be happy to show you the inviting quarters and the type of quality cat care we will provide for your little friend. Cleanliness and Sanitation – We know you want your cat to be boarding in a clean and sanitary environment. Our animal hospital is disinfected regularly to ensure the good health of the cats in our care. Good Health Care – Check out our boarding facility during your visit and you can ask us questions regarding how much clean and fresh water is provided, the quality cat food we provide, about the immunization requirements for all pets who stay here, and even inspect the sleeping quarters. Supervision for Your Cat – You can meet our staff members and question us on how we deal with unhappy pets and if individual care should be given to your pet. Safety – When checking out our boarding facility, you will be able to observe the safety standards and see how safe the barriers are between your pet and other pets. Security – Your pet may try to escape and find you when you leave him or her overnight. You can’t be sure of the security measures to which friends and family might adhere to as pet sitters, but you can be sure that our cat boarding facility will ensure your cat’s safety and regular feeding and treatment schedule. If you decide our veterinary clinic is indeed the perfect place to watch over your kitty, please provide us beforehand with the most up-to-date information regarding any specific medications they must take or food they must eat depending their age, breed, and lifestyle. Our veterinarians will advise and provide your cat with any necessary treatments prior to boarding. When the time comes to drop off your cat at our hospital, you may bring along your cat’s favourite food, a blanket, and one or two of his or her toys so that they have something familiar to smell, eat, and play with while boarding. This will really help make their visit all the more comfortable. We request that an updated vaccination and parasite prevention program be pursued before boarding all cats at our clinic so that all pets are kept safe and healthy. If it’s needed for your cat, these services can be provided at the start of their boarding time to ensure your cat, as well as the other cats in our boarding facility, is safe and of good health. We can help you take the worry out of your travel and the stress out of leaving your beloved pet behind. Learn more by inspecting our facility at 3995 Hastings Street, Burnaby, BC, V5C 2H8 or call us at: 604-291-6666.